Appeared in the Wisconsin State Journal 'Homes' section, Madison, Wisconsin, October 22, 2000. The Rev. Max Gabler might have thought the Almighty was playing some kind of cosmic joke on him when he saw what his new neighbors were doing. In almost four decades as pastor of the First Unitarian society, Gabler continuously struggled to keep his congregation dry as the copper roof on his Frank Lloyd Wright-designed church sprung perpetual leaks. That very same copper, which was torn off when the roof was replaced, was being used to shingle the house being remodeled next door by Leslie and John Taylor. Hail marks and all, the green metal had been cut into 18 by 18 inch square siding. "I'm just delighted to see the copper being used," said Gabler, adding that until the Taylor house was built, the old copper was mostly being used to make jewelry. The house, which the Taylors moved into last September and has won architectural awards, is full of such surprises. "The neighbors were pretty upset when they saw what I was building," said Taylor. "I was, too. When this big plywood tower went up, I was appalled. I thought, "what have I done?" But now, I see some of the elements of my house - the funny roof lines, the cantilevers, the suspensions - in this neighborhood." It all began as a sketch on the back of a Chinese restaurant menu. "Some of the best work is done on the backs of cocktail napkins and menus," said John Taylor, who previously owned Atlas Pasta and has a background in art and restaurant management. The next step was hooking up with Design Coalition architect Lou Host-Jablonski, who is known for doing environmentally friendly things like using hay bales as insulation. The pair set out to save as much of the original square, cinder block dwelling as possible. The land and house had cost $5,000 when it was built in 1943 by Hazel Rice, a much-loved widow who raised her four children there. A subsequent owner had gutted the house in a modernization project, but ran out of money before finishing it. "That taught me a lesson," Taylor said. "You don't have to eliminate everything someone else has done. I wanted to use as much of the old house as I could. You look back at the Swedish and German farmers who lived in this area -- they wasted nothing, not even their time. Everything was used and reused again. They had a self-reliant, sustainable lifestyle." In addition to the recycled copper shingles, there are weathered boards from old Baraboo Hills barns on the facade. Taylor bought the vintage lumber from a timber wright who specializes in salvage wood. 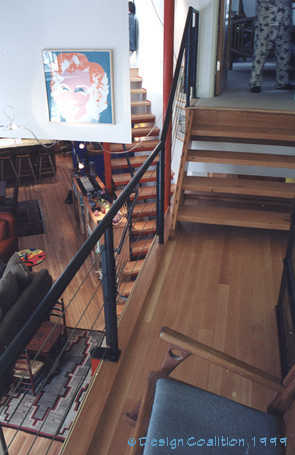 The kitchen cabinets and suspended staircase are made from Douglas fir that once was flooring in a Chicago warehouse. 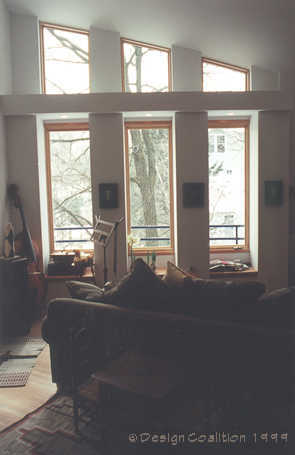 Wood from the original roof became window seats. To take advantage of solar energy, computer software was used to determine how the sun's rays hit the Taylor's land. "This house attracts the sun in winter, and repels sun in summer," Taylor said. "We studied the sun to figure out where to put windows and overhangs." 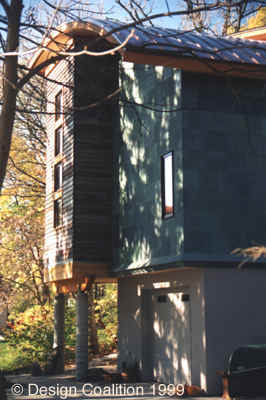 The most novel use of passive solar is the nook that contains a series of tall fiberglass tubes, each filled with water and different colors of batik dye. 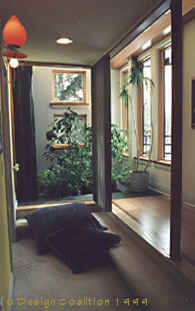 The water stores heat during the day, and in cold weather, a fan blows the heat from the water into the main living area. In the public areas of the house, there are no window coverings. There's no need for them because the window boxes were angled so no one could look in without standing close and craning their neck. The windows are arranged so that when you look outside the house, which is backed into a hill, you see only sky and greenery. "It's like being in a tree house," Taylor said. The design also makes efficient use of space. A suspended overhang serves as an office, and twin sunken bedrooms of the Taylors' two daughters have lofts above the sleeping areas, where desks and toys are kept. 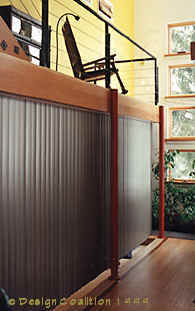 Vertical blinds can be drawn to separate the girls' rooms from the main living area. ...and open, showing colored water tubes (for heat storage) in the background. "Now the girls use it like a theater, but when they become cranky teenagers we can block them off," he said, adding that the rooms are soundproof. The kitchen reflects Taylor's restaurant background: The upper shelves are open. There are two sinks, a Viking stove, and extra refrigerator space under the work island, which is spanned by a piece of Spanish granite. As a practical as the house is intended to be, it is full of fun and whimsy. One wall is a vivid lapis blue, the other a sunflower yellow. And for no other reason that Taylor can recall, he decided to paint steel pillars red, "like a fireman's pole, which is kind of a joke. Then I decided to paint all the rest of the structural steel red, too. "This house is about being a free thinker, which is not something people in this society are encouraged to do."